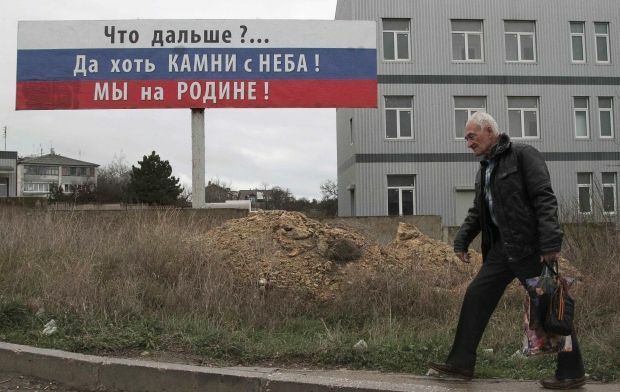 Supermarkets in the occupied Ukrainian territory of Crimea saw few buyers on Wednesday morning, as sellers changed price tags on Ukrainian and Russian goods, the prices of which have risen by RUR 300-400, according to local news service Novosti Kryma. As a result of a record devaluation of the Russian ruble, building supermarkets in Simferopol changed prices several times overnight, and certain goods have no price tags at all. "Yesterday, German laminate cost RUR 650-680, [while] today the same thing costs around RUR 5,000 rubles for the same number of square meters," a seller at the building supermarket Novaia Linia said. Sellers have also complained that many products are not available, or are delivered only under order and with new prices. According to Novosti Kryma, the inhabitants of Crimea have even been buying Ukrainian hryvnias in the exchange offices on the peninsula to protect their saving against the plunge in the value of the Russian ruble.